This was my third visit to this Avalon restaurant in the past year (second visit since I started this blog). Seven hungry weekenders (John & Cathy B. were going to be arriving late) made the 200 yard trek from our borrowed beach house to this seashore restaurant on 8th Street in Avalon. Previous visits have been very nice so we were excited about what would lie ahead. It was icy cold outside and warm and comfy inside the brightly lit restaurant. Wines were opened, menus were passed around and barbs were traded amongst the men. 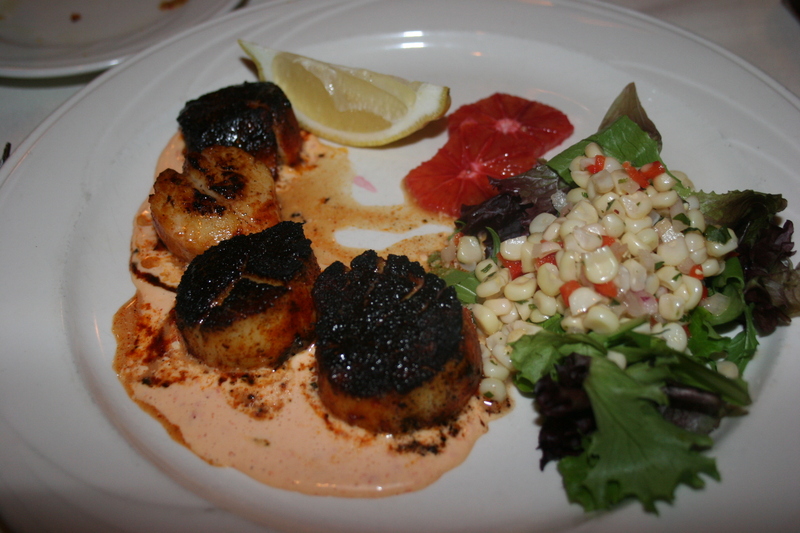 My eyes focused on one particular appetizer that sounded delicious and that’s what I chose, Pan Blackened Scallops served with Sweet Jersey Corn Salsa and Blood Orange Chipotle Lime Aioli. The scallops arrived perfectly cooked and the aioli was the perfect sauce to compliment these treasures of the sea. Portions were very generous and I totally enjoyed this delectable starter. 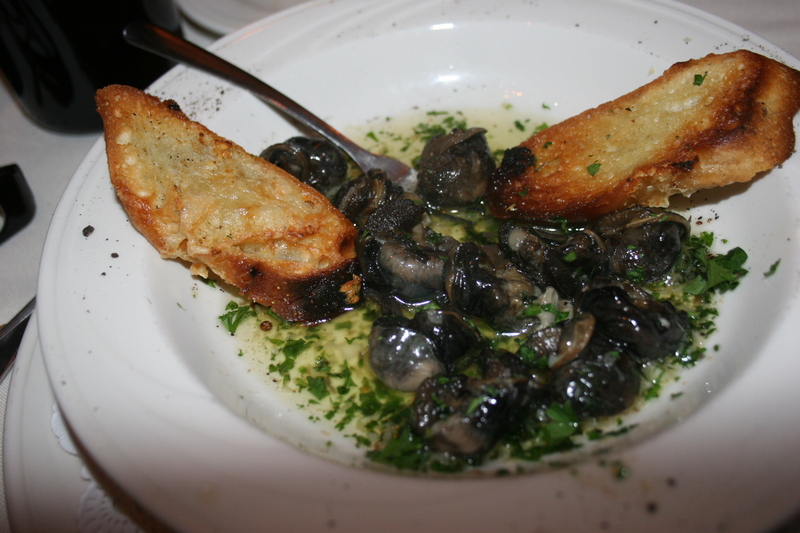 John G., who is secretly involved in a torrid love affair with every snail in France, ordered the French Burgundy Escargot in Sauternes, Roasted Garlic, Shallots, Fresh Parsley and Toasted Brie Baguettes. I’m not sure whether I was offered one and declined or whether John devoured these little slimy creatures on his own. I do know they were eaten at something quite faster than a “snails” pace. 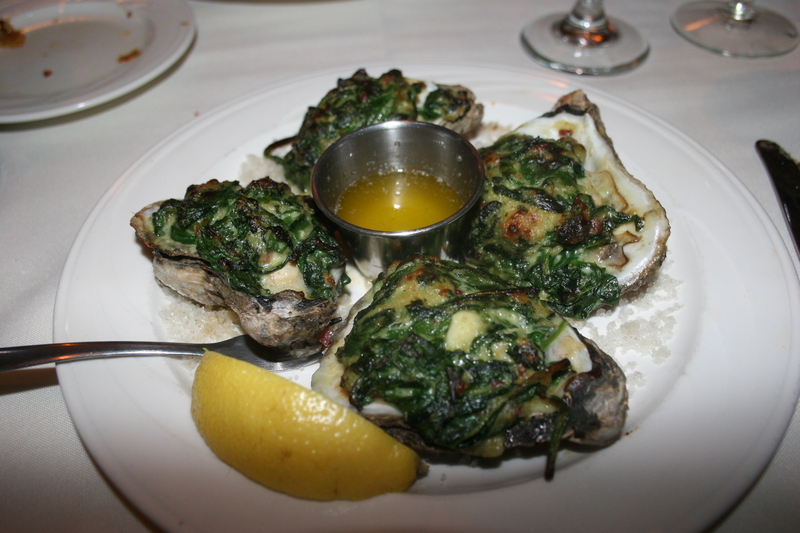 I believe it was Gerry B. who chose the Oysters Sorella, Baked and Topped with Creamy Parmesan, Spinach, Crispy Pancetta and Splashed with Pernod. They looked good but I avoid oysters, clams and mussels whenever possible. They just aren’t my thing. JoAnn B. had a nice looking salad and that’s about the extent of my memories of what others were eating. My scallops were gone and I was anxiously awaiting my choice of entree. 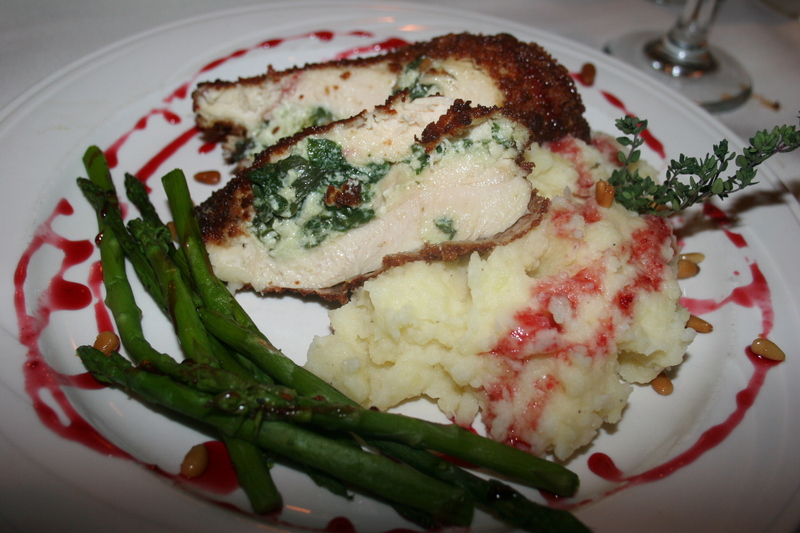 I had thought about the filet, passed on the scallops since I had them as an appetizer, and zoomed in on the Panko Encrusted Chicken Breast Stuffed with Boursin Cheese, Spinach and Toasted Pine Nuts with a Pomegranate Syrup. It was delivered with potatoes and some nice green beans. I have never been a huge fan of Pomegranate anything but tonight that tangy syrup provided one of the few bright spots for an entree that should have been wonderful, sounded terrific, even looked rather inviting on the plate. The only problem was, it lacked flavor. My wife, Kathy, had ordered the same thing and she totally agreed, which absolutely confirms my opinion because she almost NEVER agrees with me. I can’t explain why, it was simply bland and devoid of flavor; the pomegranate syrup doing its best to liven things up. I’m going to forgive Sorella Rose for this miscue as other meals there have been better, the ambience of the place is very nice, the owner is personable and the scallop appetizer was outstanding. 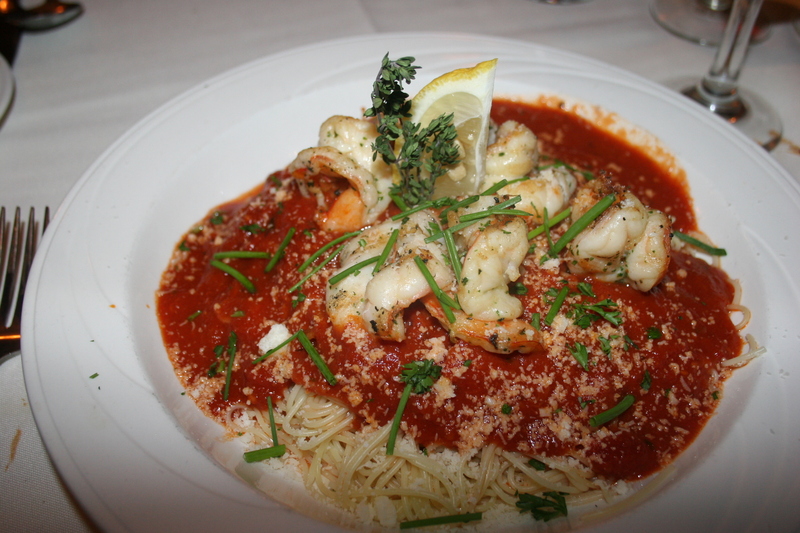 Our dinner companions fared much better as Gerry loved his selection of Fresh Angel Hair Pasta with Spicy San Marzano Pomodoro Topped with Lemon Basil Grilled Shrimp. I thought he’d have some left to take home but he paced himself and finished his entire plate. John G., to my left went with another seafood plate . 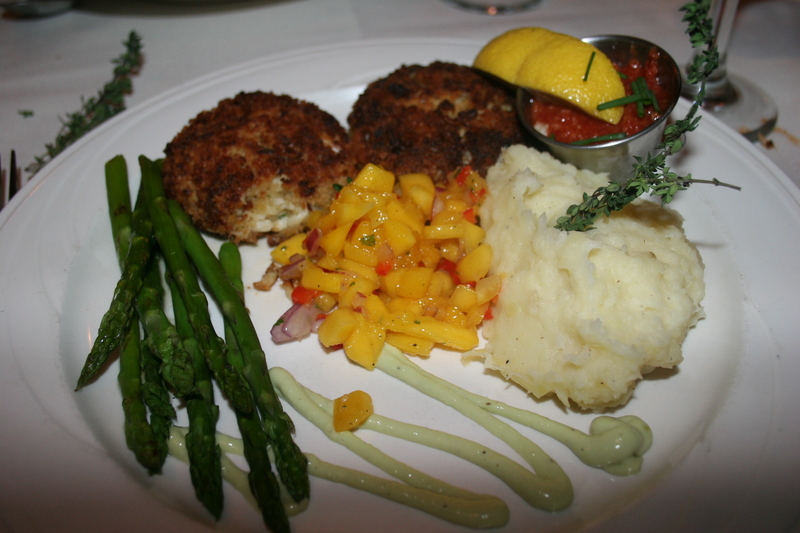 Sauteed Jumbo Lump Crab Cakes served with Fresh Mango Salsa and Avocado Keylime Aioli. It looked good and his silence while devouring it confirmed that he was pleased with his choice. We passed on dessert only because we had so many Christmas cookies and sweets back at the house. Despite my disappointment with my chicken entree it was a nice evening and we would certainly return to Sorella Rose. It should be mentioned that in paying the bill John G. noticed that all of our appetizers were priced a few dollars more than the listed menu prices. It turns out they accidently charged us from their New Year’s Eve Menu. The situation was quickly rectified but it does go to show that it pays to stay home on New Year’s Eve as many restaurants inflate their regular menu prices for the special evening.